What is a Windows Mouse Cursor? This article serves as an introduction to Windows mouse cursors. 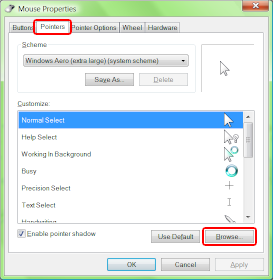 You'll learn what it is, how to switch your active mouse cursors and how to create new ones. Knowing how computers store images is an advantage. A mouse cursor or a mouse pointer is a small image that represents your hand on the computer screen. The typical cursor is an arrow pointing up-left. As you move your mouse, the cursor is moving on the screen. When a mouse button is pressed, the object below the tip of the arrow is activated. The point (image pixel) on the tip of the arrow is called the "hot spot". This point determines what gets clicked when you press the mouse button. The cursor does not always look like an arrow - for example it may look like a hand with the index finger stretched. In case of a hand cursor, the hot spot is at the tip of the index finger. For other cursor shapes, the hot spot may be in various positions, but it is usually easy to guess where it is. Cursors in the cursor library on this site are drawn over a cross-hair to easily see where the hot spot lays. Windows does not always use the arrow cursor. It uses different cursors in different situations. There is a hand cursor for internet links, a circle or hourglass cursor when your computer is busy and other. There is a total of 15 different cursor roles. The displayed cursor indicates what is going on and what happens when you click. There are these situations (cursor roles): normal, help, working, busy, 6x resizing, move, precision, hand drawing, text, link, and alternate selection. A complete cursor set contains cursor for each of the 15 roles and the all of the cursors share the same style. You can download original cursors in the cursor section of the gallery. There are multiple ways how to change cursors. RealWorld Cursor Editor and the Change Cursor utility offer comfortable way to change your cursors. Even without any special software, you can change cursor from the control panel. A control panel where you can change cursors for individual roles. This site offers a freeware cursor editor. Download it, watch a tutorials and start creating your own cursors. Instead of using a static image, cursors can be animated. The animation is created by putting multiple images into a single cursor file and displaying them in a repeating sequence. If you have a modern web browser (Firefox or Opera), you will see this cursor in motion. Windows uses .cur file format for static cursors and .ani file format for animated cursors. The .cur file format may include multiple images in different sizes or color depths, but Windows always resizes them to 32x32 pixels. Due to this reason, .cur files usually only contain a single image. The .ani file format is in short a container for multiple .cur files. In addition to the images, it also stores the speed of the animation and the order in which to display the individual frames. Windows 7 is capable of using larger cursors, but only if it is running in very high DPI mode - in 144 DPI. In this case, it uses 48x48 pixels images. More info about Win 7 cursors. Please someone explain to me on how to edit the cursor modifier?